The A/R Open Item File is the file where all transactions that occur between you and your customers are stored. As such, it is a very im­portant file. Any time you want to know how much a customer owes you or how old an account is, the programs will refer to this file to find out. Initial setup of the Accounts Receivable package will require entering all open items that are outstanding at the present time with your cus­tomers. The A/R Open Item File application is where you will do this data entry. This may be a considerable amount of data entry, but is necessary to set your customers’ balance and provide some detail on the customers’ statements. When you finish entering the initial contents of the A/R Open Item File, you can then run the Set Customer Account Balance application. This application will read through all transactions for each customer, totaling them up as it goes. It will then set the Account Balance field in the customer's record to this total. This is a handy way to ensure that the customer's account balance as stored in his Customer record actually agrees with the contents of his account. You should also be aware that the transactions you enter into a cus­tomer's account will not be posted to any Sales or Accounts Receivable account in the General Ledger, to any salesman in the salesman file, to any record in the commissions due file, or to any file other than the A/R Open Item File. If you are also using the General Ledger package, you will have to make manual entries into these accounts that correspond to the Sales and Accounts Receivable figures entered here. Once you have entered into the A/R Open Item File its initial contents, you will probably never use this application again. From that time on, all sales transactions will be entered by way of the Sales Processing application and all payments will be entered through Cash Receipts processing. These transaction applications will automatically record the amounts that are to be posted to General Ledger. You will no longer have to make manual entries to G/L once you start using Sales and Cash Receipts processing. What does an open item mean? It is a record of some transaction in the customer's account that has not yet been fully paid off. For example, if a customer made a purchase from you in the amount of $500 the record of this transaction in the A/R Open Item File is called an open item. Even when the open item is fully paid off, it still remains on file until you decide it is time to remove it. Elliott does not automatically remove every open item that is paid off from the Open Item File. The invoice and all payments that have been applied to it are kept on file. Otherwise, the statements that you send to customers would not properly reflect all the business activity that has transpired. When you have printed statements and are convinced that they are accurate, then run the Purge Closed Open Items File application to remove all fully paid open items. I = Invoice. This is the record of a regular sale. The $500 purchase your customer made from your company would be recorded by way of an invoice. P = Payment. A payment transaction is the record of a payment made by the customer on their account. If the customer sent you $300 toward the $500 he owes you, the record of the $300 payment would become a payment transaction. C = Credit Memo. A Credit Memo is a transaction recording some sort of credit you are giving the customer, usually because some of the goods sold were found to be unsatisfactory upon receipt. Perhaps some of the goods were damaged or found not to be exactly what was ordered. In this case, you would give the customer credit against the amount of the original invoice by entering a Credit Memo. D = Debit Memo. A Debit Memo is a transaction recording some sort of an additional charge that is to be added to the customer's account. For example, let us say that the price of the sale was negotiated with the customer based on a certain shipping method, which later on turned out not to be fast enough, and a faster (and more expensive) method of shipping was used. You could charge the customer for this additional expense by entering a Debit Memo, which will add to the amount the customer owes you for the sale. F = Finance Charge. A Finance Charge is an amount the customer owes you because he has open items on his account, which are too long over­due. B = Balance Forward. This type of transaction is not one that you will deal with very often, especially after you have entered the initial contents of the A/R Open Item File. The purpose of this type of trans­action is to allow you to enter a single amount that the customer owes as of a certain date, without having to enter all the detail that com­prises that amount. For example, when you are first loading the A/R Open Item File, you may not want to enter every outstanding open item for every customer. Instead, you could enter just one Balance Forward transaction for the total amount of what the customer owes you at that time. Note: This should only be used for Balance Forward Customers. If a customer uses Open Item accounting, he will usually designate which open items he is paying when he sends a payment for his account. In other words, he applies cash to particular open items. The way Elliott keeps track of this is by storing in the payment trans­action the invoice number of the sale transaction that is being paid. The invoice number that is being stored in the payment transaction is called its apply‑to number. 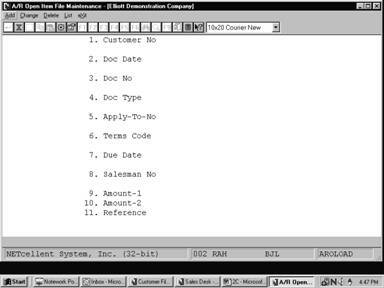 Then, Elliott can determine that a payment was made on a certain invoice by looking at the Apply‑To Number field of the payment. Also, Credit Memos and Debit Memos usually apply to an invoice. Be sure that you enter the correct apply‑to number when you enter Credit Memos and Debit Memos. For Invoices and Balance Forward transactions, the program will automatically set the apply‑to number equal to the document number. You will be allowed to change this assigned apply‑to number, but there is no reason to do so. One important thing to keep in mind is that if the customer uses Bal­ance Forward accounting, then he does not apply cash payments to par­ticular invoices. For this reason, the concept of apply‑to numbers is not pertinent to a Balance Forward customer. Elliott will auto­matically set the apply‑to number for all transactions for a Balance Forward customer to zero. You will be allowed to change this apply‑to number if you wish, but there is no reason to do so. To return to the menu bar, press the ALT or F10 key. To leave this application, press ESC or X for EXIT when positioned at the menu bar. Enter the customer number. This customer number can contain alphanumeric characters as well as purely numeric digits. The customer's name will be displayed automatically. After the entry of the first customer number, this Customer No field will default to the last customer entered. This is done to speed up data entry when you are entering a series of open items for the same customer. Press the F7 key for customer search by number. Press the F8 key for customer search by name. Enter the date of the document. Default is system date. The default for the document type is I for Invoice. If this transaction is a payment, credit memo or debit memo, enter the number of the invoice to which the transaction applies. Other­wise, the program will automati­cally assign the apply‑to number. Enter the terms code for this open item. This field defaults to the Terms Code for this customer in the Customer File. Press the F7 key to search for a code. Enter the due date. This field defaults to a calculated due date which is based on the document date and the customer's terms. Enter the salesman for this open item. This field defaults to the Salesman No for this customer in the Customer File. If you are entering an Invoice, Credit Memo or Debit Memo, Amount‑1 will be the amount of the sale minus any sales tax, freight charges or miscellaneous charges. Enter for Amount‑2 the total of any sales tax, freight charges or miscellaneous charges. If the transaction is a Payment, Amount‑1 will be the amount of cash being applied to the customer's account. Enter for Amount‑2 the amount of any discount you are giving the customer along with the amount of cash being applied. If the transaction is a Finance Charge, Amount‑1 will be the amount of the finance charge and Amount‑2 will automatically be skipped. It does not have any pertinence for a Finance Charge. If this is a Balance Forward transaction, enter into Amount‑1 the customer's account balance. Again, the system will skip the Amount-2 field. 8 numeric digits with 2 decimal places and an optional minus sign (999,999.99-). See Amount‑1 above for an explanation of what to enter for this field, depending on what type of transaction you are entering. Lower case letters are allowed. What you enter here for the Reference field is entirely up to you. Usually the field is used to record some brief explanation of the transaction or to make some comment about it.